Dr. Sarah Wyrick moved from her home state of Florida to join our family. 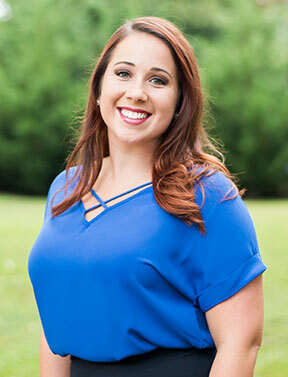 She received her training from the University of Florida and is passionate about utilizing the newest technology in dentistry and providing patients with the highest level of care. She and her husband fell in love with the area after vacationing several times to the Upstate, and wanted to be on “permanent vacation.” They have been married since 2011, but have known each other since elementary school! They both grew up in the same small town of Riverview just outside of Tampa, FL and were high school sweethearts. Her husband, Daniel, is also a UF alum and currently works as a mechanical engineer in Anderson, SC. Growing up on a farm, Dr. Wyrick is no stranger to having a house full of pets. She and her husband have a bird, two cats, and just recently added a new puppy! While in dental school, Sarah served as president of her class, an officer of the Psi Omega dental fraternity, and participated in many dental outreach programs including several service trips to the Dominican Republic and Mission of Mercy. Dr. Wyrick is currently a member of the American Dental Association, the South Carolina Dental Association, and the Academy of General Dentistry. She also participates in Dentistry from the Heart and volunteers for the Greenville Free Medical Clinic. She focuses on comprehensive dentistry as well as cosmetic smile design. On the weekends, Sarah enjoys painting, kayaking, and hiking with her husband. Of course, Saturdays during football season are reserved for watching their favorite team play, the Florida Gators!